HollowCore™ Magnetic Nut Drivers feature a thread-thru design for unlimited depth in threaded rod and long bolt applications. 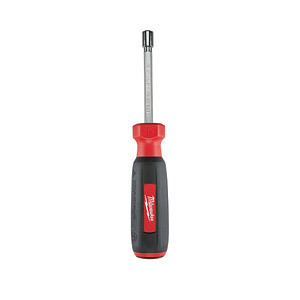 The magnetic universal driver heads fit 4X more fasteners including: Square, Hex, 12 point & Spline. Designed for maximum durability the Wrench Ready hex steel shanks are forged and chrome plated. HollowCore™ Unlimited Depth - Ideal for long bolts or threaded rod applications . Magnetic Drivers - Secure fitment in fastening applications . Universal driver head fits 4X more fasteners . Removes rusted and stripped bolts . Color Coded ID Markings allow for quick tool identification on jobsite . Wrench Ready HEX shanks deliver additional leverage . Chrome Plated - Marine Grade Rust Protection. Forged steel shanks provide longer life and more durability. Deep well sockets - Drive multiple fasteners .